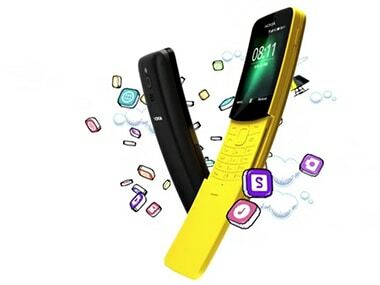 Revitalising yet another classic, Nokia, with HMD Global at the helm, has brought back to life that iconic slider feature phone, the Nokia 8110. The Nokia 8110 is a 4G feature phone. It’s also smarter than the average smartphone because it includes support for apps like Google Assistant, Google Maps, Facebook, Twitter, and even the iconic Snake. Available in several eye-catching colours, the phone offers a feature-phone worthy 17 days of standby with 9 days of talk time. The device is powered by a Qualcomm Snapdragon 205 Mobile Platform (dual-core 1.1 GHz) and includes 512 MB of RAM. Internal storage is limited to 4 GB. The display is a 2.4-inch QVGA unit and the device comes with a 2 MP camera. The battery is a 1,500 mAh unit. Other features include support for FM Radio, various audio file formats including Vorbis. The device takes a microSIM and supports VoLTE, which means that in theory, it should even work with newer networks like Jio. The 4G support is the real boon here, and we’re glad to see it on a feature phone. The phone will be available from May 2018 at a price of EUR79.